Practice Area: The practice facility includes a driving range that can accommodate 15 golfers at one time and it includes yardage banners as targets. To the left of the range tee is a chipping area and practice bunker. The practice putting green is located adjacent to the first tee. Description: This course is located in Lancaster, SC, accessible from Charlotte via US 521 or I-77 to Hwy 9. 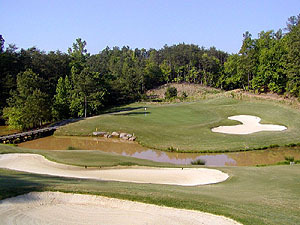 It features Bermuda fairways and MiniVerde Ultradwarf Bermuda greens. The front nine was designed by famed architect Donald Ross and opened in 1939, with Russell Breeden renovating the front nine and architecting the back nine some 25 years later. 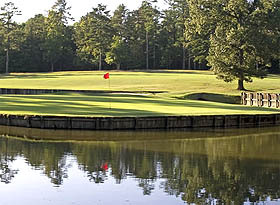 All the greens are extremely fast, and water hazards come into play on three holes. Notes: The course offers very affordable membership plans with no initiation fees. B-Man's Take: This is one of the few area courses I have not yet played, but I have been getting great reviews about it. It can be quite a haul from the northern or eastern parts of town. So I might suggest you make a day trip and play 36, with your 2nd round at Edgewater. The signature hole on this course is the 7th, a 157-yard par-3, requiring a tee shot to an island green surrounded by water.